Our strong wind but quiet air conditioning fan can create your own personal cooling zone. It is a perfect cooling device in summer hot days or daily use in dorm, home, office, etc. Made of high quality material, tough and durable. 3 speed fan not only cools but also circulates moist air. Low noise design, effectively reduce noise while working. Can use it in your dorm room, at the office, beside sofa, on your nightstand, dressing table, dining table, study desk, or anywhere you'd like to be a little bit cooler. Comes with USB cable, can be charged by computers or power bank. 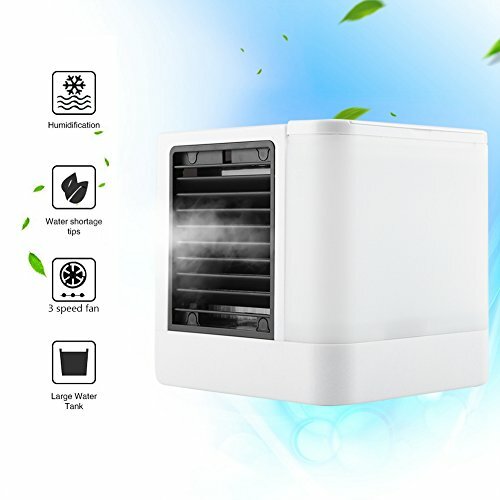 Perfect air conditioning fan designed for air cooling, humidification, steaming face, fresh air and so on. Please allow 1-3cm error due to manual measurement and make sure you do not mind before ordering. Please understand that colors may exist chromatic aberration as the different placement of pictures. ➤【Personal Air Conditional】Based on the natural water evaporation technology,delivers a stream of cool air where you need it most,lowering the temperature of your personal space by up to 12 degrees. ➤【Easy to Use】Simply add water and ice to the reservoir and you will enjoy hours of cool, clean and comfortable air conditioning. This unit is lightweight and portable, so take it anywhere you need a blast of cold air! Easily plug it into an electric plug or USB port and immediately create your personal comfort area! ➤【3 Asjustable Speeds】You have 3 options to meet your demand when you are sleeping, working or doing outside sports. The wind blade is adjustable, move up and down 90 degree like air conditioner. ➤【USB Charging】USB charging or AC current supply; built-in water tank, once full, can last for 8 hours，which is convenient to take it to any place,even outside when your fam. ➤【Energy-Saving】Low Energy Consumption same as the power consumption of a light bulb,uses no freon,much cheaper than running a freon air conditioner in Hot Summer Days. View More In Evaporative Coolers. If you have any questions about this product by Huhushop, contact us by completing and submitting the form below. If you are looking for a specif part number, please include it with your message. © 2019 - avodotyisrael.org. All Rights Reserved.